Why don't we buy persimmon often? M asked while we were walking through the fruit aisle of our supermarket. Always armed with an answer to M's food related queries, or so I pride, I couldn't answer that for once. What I didn't want to admit was I didn't have enough ideas of what to do with it. I'm one of those people who think eating fruits in their raw form is the best way to enjoy nature's treat. But each experience with Fuyu persimmon left me, often wondering in vain, how the fruit needed a little support, a little boost from something. This time around, I picked up some Hachiya to try. Persimmons are generally of two types, Fuyu and Hichaya. Hichaya, the one you see above are acorn shaped and can be astringent if eaten when unripe. Wait till the skin goes deep orange and soft to enjoy the sweet, juicy and delicate flavor of this fruit. Fuyu on the other hand is more forgiving as it's a non-astringent variety, milder in flavor and doesn't have to be very soft to be sweet. Though I ended up using Hichaya and barely managed to slice it since it was soft and had to keep the skin on for slicing but Fuyu would be actually perfect. So I recommend using Fuyu but pulpy Hichaya would work perfectly well too, just probably not sliced. If you bring home Hichaya, which are not ripe, let them sit in the fridge for couple of days and it turns into this jelly like sweet heaven, which you can just scoop up with a spoon. Here, persimmon which often comes from Lebanon is called 'Kaka fruit'. I was so tempted to call this Kaka salad! Feta cheese with persimmon was just the combination I was looking for. 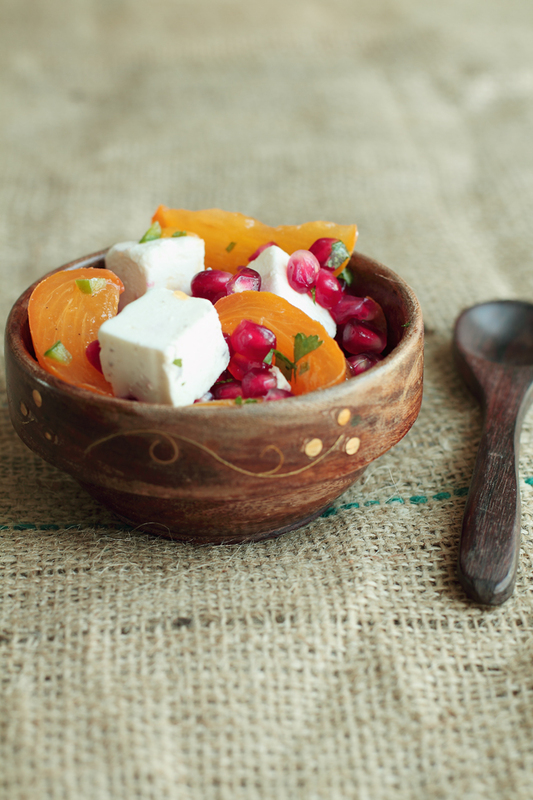 The sweetness of persimmon plays well with the tangy and salty feta. 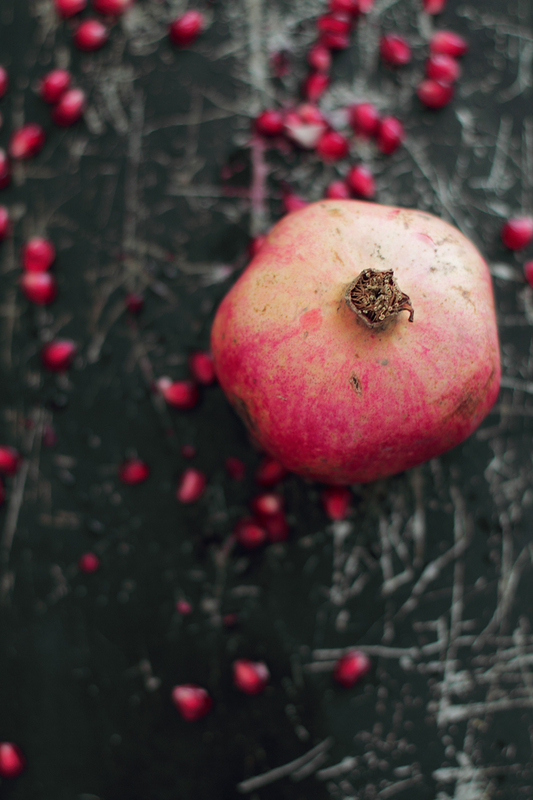 The pomegranate seeds add rich ruby color and crunch. They make the salad a treat for the eyes as much as for the taste buds. The chili lime dressing adds zest, freshness and brightens up every other flavor. 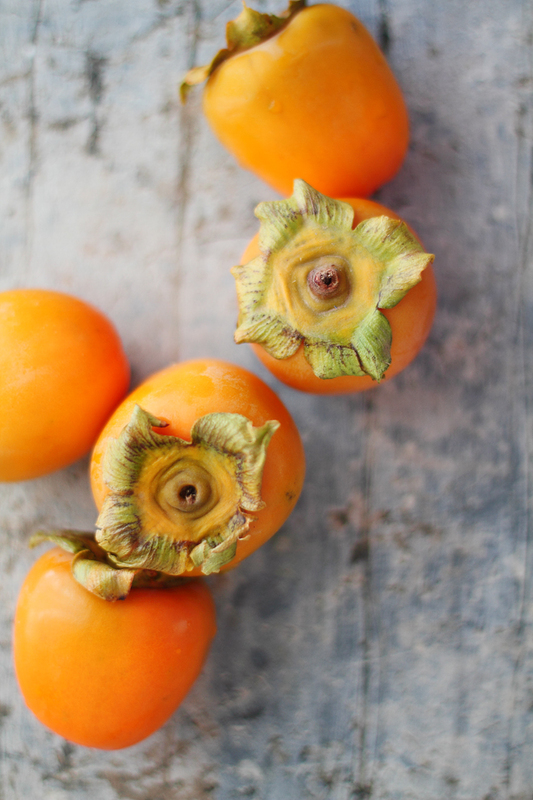 What do you do with persimmon? Share your ideas and links in comments below. Combine lime juice, serrano chili and slowly whisk in the oil. Keep aside. Place all the ingredients with in a large bowl and lightly toss in the dressing. Season with salt and pepper if required. I never had that fruit before but it sure does look amazing. I too like to eat fruit just plain .. may with some salt and pepper at times. This looks very refreshing and colorful! Beautiful salad! Love the flavours :) That chili lime dressing sounds very interesting!! Wow! That's beautiful. I was introduced to persimmons last year and absolutely fell in love. This salad looks really delicious. 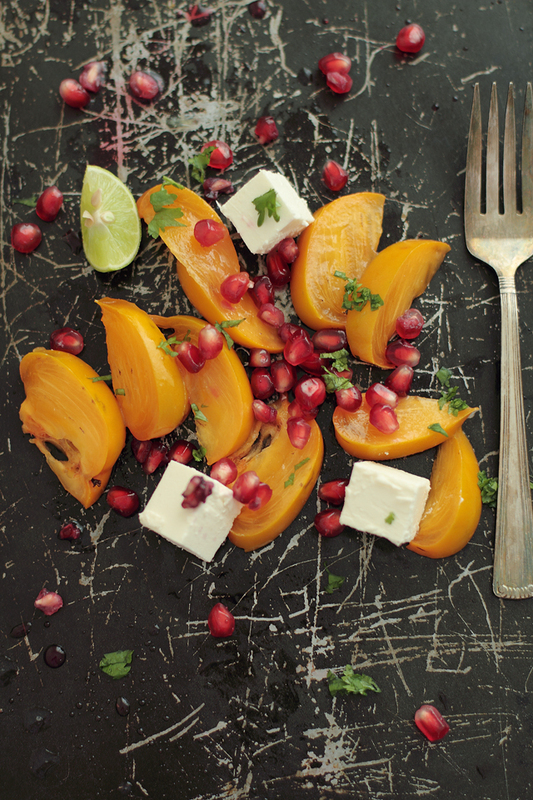 I bet the salty feta was perfect with the persimmon. I enjoy your photos so much. I am guilty of passing over both persimmons and pomegranates, but I love what you've done with them. That dressing sounds amazing, I bet it has quite a kick! Pomegranates and persimmons are two of my favourite exotic fruits. Thanks for the post. Gorgeous. Persimmon! I love them, but I prefer the firmer type. In my old house, we used to have a tree! Love the combination of fruits and colors here. those pictures are insanely good. and love the write up on persimmons...I can barely pronounce the word, let alone cook with it, so the little persimmon cookery lesson was much appreciated! I always look forward to Persimmons being in season. I haven't seen any yet near me, but it should be soon! Stunning salad! I must get my hands on some persimmons! Love the sound of this. I remember the first time I tried persimmons I could not believe I hadn't had them before! One of the fruits i love to eat is Persimmon, I just eath it like that, but i do love this idea . I am sure gonna try it once. Good thing your temptation didn't overcome you to call the salad that. You smarty pants! ahahahah This salad is gorgeous. Love all the seasonal ingredients. I usually use Hichaya for the reasons you stated and agree I always eat fruit raw and it never makes it into any dishes but salads and fruit are heavenly paired together so I am getting better at incorporating them. Love you combination and the vinaigrette. Happy Diwali Kulsum if you celelbrate! Great sounding salad kulsum. I agree that fruits are best eaten in their raw form on their own :) I am seeing persimmon on the market but I have never eaten it and had no clue what I could do with it so thanks for this idea. That looks so good and fresh! Perfect for this hot weather we're having lately. Its funny you shared this post just now. Only yesterday I tasted a persimmon for the first time in my life and I have to say it was good. Other thing in ABUNDANCE here are fresh poms. Will try this one for sure. very beautiful colors and clicks Kulsum.. prettyness in such simplicty. I love persimmon, never thought of making a salad with it. This looks absolutely delicious, will try it soon. Love the vibrant colors here :) Never bought persimmon to try at home but have tasted it to liking! This is my fav kinda dressing- kicking & citrus ! What a lovely salad! The pairing of flavors here is marvelous! I love anything with feta, and especially when it is showcased so beautifully like in this salad! And I just love your wooden bowl, so rustic. Didn't know this fruit's called Persimmon :) I usually enjoy sucking the juicy fruit from the skin but I could do with a bowl of this salad. Minus the feta, of course-- m not a cheesy person! You know, I don't think I've ever eaten persimmon. I look at it in the fruit shop and then always walk past never knowing what to do with it. I love the salad you've put together though, all the colours look beautiful. A bowlful of goodness, every bite of it! We will soon start seeing this delicious fruit here and just by itself is the way we like it. Such an unusual combination. I love the colors too. Brilliant stuff! Oh, I would definitely love looking and eating this salad. I just love your last photo! Wow Wow Wow! Okay, now that I'm still wow-ing I need to tell you that I just fell in love with your salad...must.try. I'm not sure if I've ever had a persimmon. But this salad would be a fantastic place to try it out! This looks delicious! SO beautiful! I'm tucking this one away for when persimmons come back in season next year in Queensland! It's a pleasure to *meet* your blog! This is too beautiful - I am just imagining the flavour explosion of this colourful salad!! And such gorgeous pictures too!! These pictures look wonderful. I like the combination of ingredients in this salad! Just found your blog through Adalou. Love the colorful pictures! It definitely makes this picky eater want to try new things. I'm a fruit lover, but I have to admit that I've never had a persimmon. Might have to try this recipe out! oh my, your photography is amazing! that looks so fresh and healthy.we've got a pomegranate tree and we could use this recipe for it! stunning phtography--very serene, and somehow both minimalist and lush. the lighting is perfect. your recipe is so descriptive and straightforward that i have enough confidence to try it! thanks so much. i'm happy to have discovered your blog. This salad looks wonderful! Love your photos and site design; looking forward to reading more!